The Fujifilm FinePix F70EXR improves on most of the core functionality of the F200EXR camera at a much more affordable price-point, although it's not all good news - obvious purple-fringing and an effective resolution of just 5 megapixels in most of the EXR modes detract from the overall image quality. The major difference between the F70EXR and the F200EXR is the former's versatile 10x zoom lens. Offering a 27-270mm focal range in such a compact body is a real attraction of this camera, more than making up for the smaller LCD screen and the slightly reduced megapixel count. It also opens up a new market for Fujifilm, with the F70EXR competing directly with other travel-zoom cameras like the popular Panasonic TZ series, Casio EX-H10, Canon SX200 IS and the Samsung WB500. It offers a completely different approach to all of its competitors, with the ability to set the aperture and shutter speed (although slightly limited) in particular marking it out. All of our previous lavish praise about Fujifilm's EXR mode applies equally to the F70EXR - it is as effective in practice as it is revolutionary in principle. The D-Range Priority (DR) mode in particular is literally a real eye-opener, recording much greater dynamic range and preserving more detail in the shadows and highlights than either the F70EXR's own high-resolution mode, or any other compact camera that we've reviewed. The EXR - High ISO & Low Noise mode is admittedly less successful, producing slightly less noisy images at each equivalent setting than Resolution Priority mode, but this is tempered somewhat by the latter mode's excellent results from ISO 100-800, a much more versatile and usable range than most compacts offer. 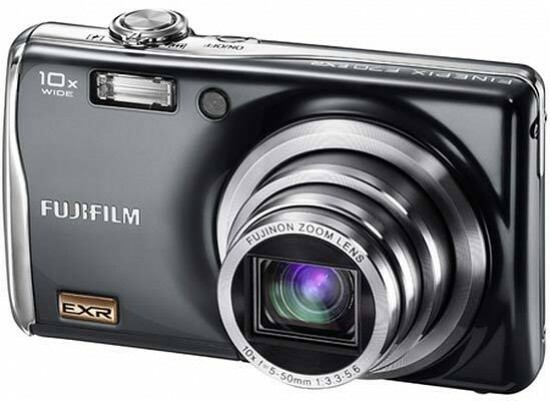 In essence the Fujifilm FinePix F70EXR takes both high-resolution photos with relatively little noise at the ISO speeds that you'll use most often, plus the added bonus of smaller 5 megapixel images with dynamic range to die for. Even if you can't decide between the different modes, the camera does a great job of picking the right one for almost every situation that you'll encounter.